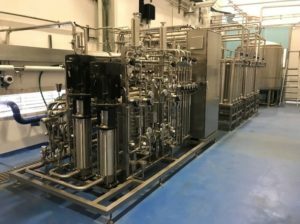 We are a turnkey supplier of purified water and WFI systems and developed our own differentiating pre-treatment technologies ESR™ and HOD™ (Electrical Scale Reduction and Hydro Optical De-chlorination) with a very economical payback time for end-users in the pharmaceutical and biotech industries. Actually, our technology combines both worlds of purified water and WFI generation in one process and is in operation at 12 pharmaceutical companies. Substantial water and electricity savings and no chemical consumption, resulting in a highly optimized Carbon and Water Footprint. On top of that, this economical solution is absolute reliable and sustainable. We are not using filtration media (softener and activated carbon filter) in the pre-treatment and in the total system there is no bio-hazard or microbiological activity. We call it Continuous Bioburden Reduction – CBR™. The very compact pre-treatment is not wasting water at all and the total PW / WFI (Pre-treatment / RO / CEDI) unit is not using chemicals.